Jane is coming back to Los Angeles from college next week, and she needs a car. Well, I need her to have a car because I don’t share well and I’m not excited about ridesharing as a full-time plan. We got rid of Jane’s car when she decided to go to school in New York City. Naturally, she won’t be needing it for the bulk of four years. During short breaks, like winter, I can rent a car, and she can drive mine as it’s prohibitively expensive to have a driver under 25 on a rental car. But for summertime, I’ve tried to find other solutions. I’m still unclear on what we’ll do but here are the options. Buy a beater and then sell or donate it at the end of the summer. This was my first plan, and I found a 1983 Ford F150 that I thought would be a lot of fun to drive for the summer. In fact, it was a manual transmission, short bed, and only leaked a little oil. I was going to go and buy it for $3,500 on Tuesday but thank goodness AJ and I almost had an accident on Sunday. The freeway just came to a dead stop in front of us and had we been in an old car without power ABS brakes we’d have been in a major accident. None of us are driving a beater. This still may happen. I have a luxury car reserved with Enterprise for the summer. It’s a Cadillac XTS or equivalent that comes with unlimited miles at $1,430 a month. The after-tax total for three months and 11 days is $5,760. There is no other cost involved. This car doesn’t go onto my insurance, require registration or a fee when I turn it in. If I want to save money, I can scale back on the model and drive something more modest. I’ll also get a bunch of frequent flier miles as well as double points on my credit card as it’s a travel-related expense. 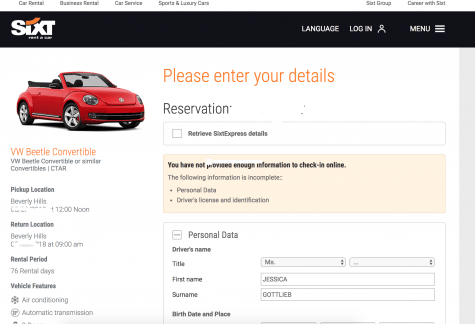 Sixt is a German car rental company. I’ve got a convertible beetle on hold with them for next week. It’s quite reasonably priced at $35 a day. A 92-day rental puts me at $3,661.93 with more than enough miles to get me through the summer. The problem is a complete lack of communication. I can’t get anyone on the phone so I can ask questions, and that’s too much money for me not to be able to speak to a local person. The second problem, and this is a massive problem, is that their site is not secure. All you need is my reservation number and last name, and you land on a page that has been populated with my personal information. That this does not require a login is alarming. How many other backdoors are there? Sixt will give me KLM points though… so what’s a little privacy breach worth to me? These old style car rental agencies are the most convenient options. If the vehicles require any sort of maintenance I drop them off at the rental agency and grab a different one. The more I think about it; the more Canvas becomes an expensive option. 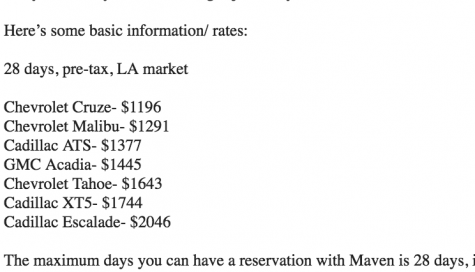 In addition to having a very limited fleet of Ford vehicles, you can only make a reservation 14 days in advance. So the Mustang I wanted to lease for the summer that was available on May 6th is no longer available. It would also be registered in my name, I’d be responsible for maintenance, and I’d have to add it to my car insurance. Two teenage drivers make car insurance really expensive. The reason I wanted to use Canvas was so that the car would be registered to me and the kids could drive it while I had my car, which I love. I’ve given up on Canvas though. If I want my daughter to love LA more than New York City the car’s going to have to fun and I can’t get a fun car with them. Fair is an app that operates a lot like Canvas. If it ever works, it could be great. But it doesn’t work. You essentially lease a lease return for a flat monthly fee and a drive off with Fair. The fees are competitive, the cars could be appealing, and it’s an open-ended lease. A buyer can walk away in two months or 20. Fair was the most attractive option for me as I could lease a car, put it in my name and the kids could drive it. Say hello to the summer of Mini Cooper! 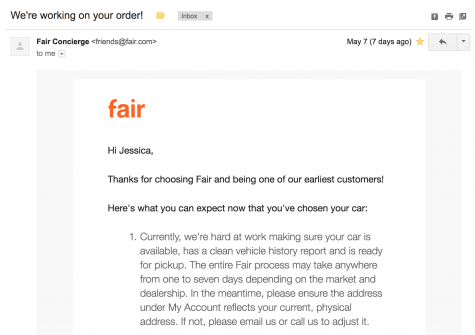 The problem with Fair is that, much like Drive Canvas and Sixt, no one answers telephones and no one answers emails. Proof. It’s a useless app. GM has Maven Reserve. It’s a lot like Drive Canvas but only good for 28 days at a time. Maven is still a good option for me if I want to be in a GM Vehicle. Interestingly Cadillac has a program for long-term rentals/short-term leases that also includes insurance much like a rental car. If I get stuck with Enterprise, it’s likely to be a coin toss as to whether I take my Cadillac from Book. 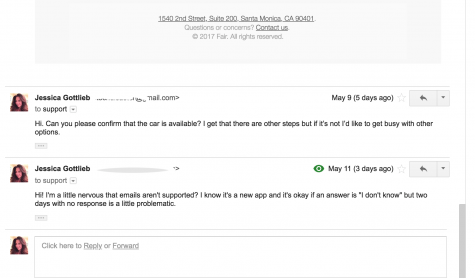 Since Book is Cadillac owned I’m guessing the vehicles will be a higher trim level than your standard car rental company and I will raise my expectations about the maintenance. Book runs $1,800 a month. There’s no maintenance or insurance required beyond that basic fee. It seems to be the best managed of the bunch, of course, it’s the most expensive too. But I do love a Cadillac. We’ll see how the summer goes and which of these companies is thriving in 2019. You have so many options! I have no idea which one is better, lol, but I bow down to your research skills. What about a beater that has ABS brakes? I have a 1999 MB e300 TD with ABS brakes that I love! I just looked on Craigslist and there’s two listed in the LA area.